Book Summary: Enter a world where the sweetest dreams are reality! This story is crammed full of magical fantasy, adventure and cotton candy! It’s the sweetest and most colorful treat to hit PlayTales yet. Let your child’s imagination run wild with an explosion of color and creativity! One night, two very lucky children staring out of their window, get wrapped up and swept away by a giant cloud of cotton candy! 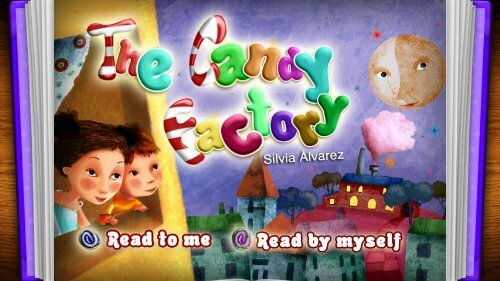 After falling down a rainbow colored tunnel they find themselves in the mysterious candy factory. Fuzzy little creatures unravel all the extraordinary secrets of the factory, a whole new world that you can’t imagine… where NOTHING is impossible! The illustrations are rich and come in HD. Playtales is by far the best app I have found for electronic story books and I would recommend it to all families. Five stars all around! Thanks to Fatima of PlayTales for sending us more information about the app and company! PlayTales uniquely delivers stories—multinational, multilingual and multicultural—from children’s authors and illustrators to families all over the world. In our new release, we’ve included yet more language options for the little ones as they learn their 1st, 2nd, 3rd or 4th languages: English, Spanish, French, German, Italian, Chinese and Japanese! We’ve also included new, interactive ways for kids to engage in the library through fun gaming features built into PlayTales books, including: Mazes, Connect the Dots, Simon Says, Coloring, Find the Difference, Word Search, Puzzles, Find the Hidden Image, Drawing, Pair Matching and Learn-to-Play Songs. Based around the idea of interactive participation and targeting children’s creativity and imagination, PlayTales makes the learning process more perceptive and intuitive. Each story is a creation made by teams of educators, artists and tech professionals who are all dedicated to wholesome and meaningful content for children. PlayTales offers quality material for toddlers (ages 1-3 years) preschoolers (ages 4-6 years) and school-aged child (ages 6-11 years) that sparks their interest and adapts to their reading levels. We take into consideration modern culture, educational demands and above all, diversity. In today’s world innovative technologies allow tools to bring our imagination to life and expand our visual and tactile possibilities. PlayTales is dedicated to this very idea of offering imagination in everything we add to a story from innovative features, diverse designs and animations to original music scores for each ebook. Or better yet, just download or update and see for yourself. where we will be showcasing PlayTales .